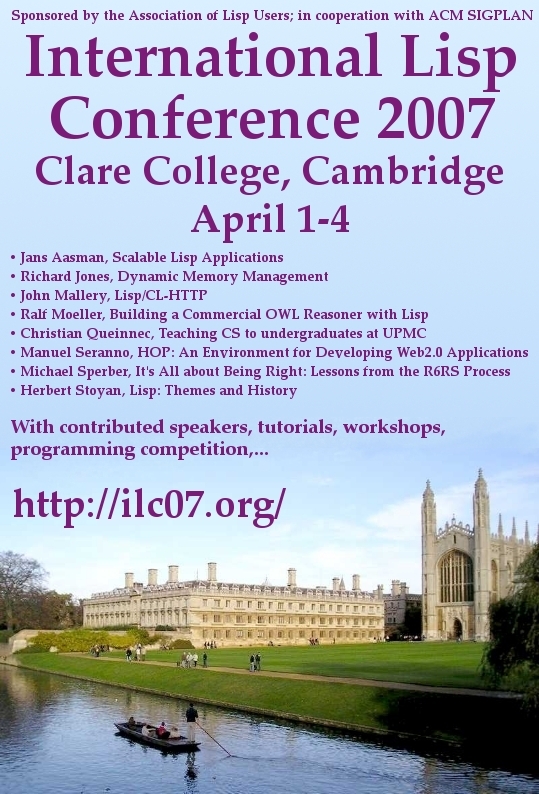 The Association of Lisp Users is pleased to announce the 2007 International Lisp Conference will be held in Cambridge, England at Clare College from April 1st to 4th, 2007. This year's program consists of tutorials at beginners' and advanced levels, prominent invited speakers from the Lisp and Scheme communities, an excellent technical session, tours of Central Cambridge, Anglesey Abbey and Ely, and a quintessential English experience: a traditional dinner served in the college's Great Hall. The advance registration deadline is March 11th. The ILC'07 programming contest is also still running until March 3rd. Conference registration is now open. The advance registration deadline is March 11th. You can get further discounts as an ACM/SIGPLAN and/or ALU member. Registration includes: access to all events, morning and afternoon teas / coffees, self-service lunch, banquet (Tuesday April 3rd), proceedings and hopefully a conference t-shirt. Accomodation is available in Clare College's "Memorial Court". Credit cards and PayPal are accepted, as are cheques (sterling or US dollars) and international bank transfers. General conference announcements are made on a very occasional basis to the low-volume mailing list ilc07-announce. If you're thinking of participating in ILC 2007, you should either join this list or take an occasional look at the archives. There are several news about this year's International Lisp Conference to be held in Cambridge, UK in the first week of April. The Register has published a press release about the conference. Nick Levine told me that it's a good idea to "digg" this article (whatever that means ;). Apparently, you can do this directly via this entry at digg. There is a conference poster available for download. Please print it off and distribute it everywhere. Finally, you can show off your Lisp programming skills by providing implementations for the conference's programming contest.